In this issue: star traders, Brainships, a tough warrior with a heart of gold—plus a Liaden Universe® covers contest! Sasha Naradnyo is a gangster on a planet where humans are most definitely second class citizens. Now Sasha’s simple choice to save alien children has thrust him into the midst of a battle that could remake the galactic balance of power and save humanity from slow death by servitude. Hard-hitting debut from Traveller and Space: 1889 game creator, Frank Chadwick. 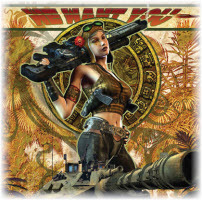 As of December 16th, Baen ebooks are now available for sale at other vendors as well as at this site. At the same time, prices for our individual ebooks were raised to meet the rest of the market. Titles available in print as hardcovers only will be $9.99, trade paperbacks $8.99, and mass market paperbacks $6.99. As part of the adjustment, we have also raised ebook royalties to authors by 25%. Available exclusively at Baen.com are eARCs and serialized monthly bundles at our previous prices. There is a significant change from our previous practice in the availability of the bundles: once the books for a given month are printed and the books made available individually at other sellers, these bundles will not be available for orders. For example, books labeled January 2013 were available for sale only until December 2012. Planet Baen, the online game where players earn free ebooks, will close shop on February 28. All earned ebook coupons will be honored, of course. 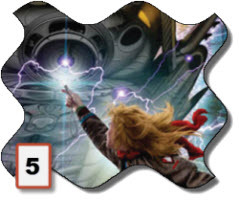 Behold: snippets from six great covers from Sharon Lee & Steve Miller’s Liaden Universe® series! Can you name the books? 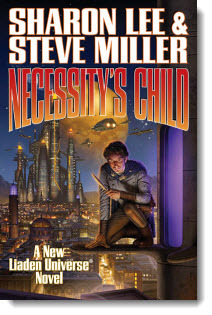 Winner receives a free signed hardcover of Lee & Miller’s latest Liaden Universe® entry, Necessity’s Child. Tia Cade has freed herself from her ravaged body to become a Brainship, but now she must discover her Brawn, the human element every Brainship requires to function. 20th Anniversary edition of the classic tale, featuring a new introduction by Mercedes Lackey. 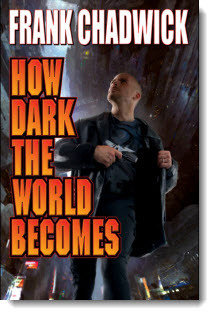 Don't forget to check out the latest Ebook releases here, plus Baen.com free fiction from Sharon Lee and Steve Miller here, and don’t miss the monthly free nonfiction on the U.S. space missions to Mercury and Pluto here.